What is Regenerating Movement ? For the person who sees regenerating movement for the first time, the sight is rather surprising. As we are accustomed to movements that are more or less controlled, governed by the intellect or worked on, any movement that falls outside the domain of conscious control suggests to us illness, madness, or hypnotism ; the regenerating movement seems to lend itself to such interpretations. In reality, it is quite different. While practicing the movement, our consciousness, instead of being anxious like that of someone ill, remains calm and serene. Instead of being confused, like that of a madman, it remains lucid. Instead of being circumscribed and limited like that of someone under hypnosis, it remains free. One does not perform Regenerating movement. It is set in motion spontaneously, in response to the needs of the organism. As those needs vary from one individual to another, and for the same individual from one moment to another, there can be no uniform, pre-programmed movement. Because of this, there is nothing easier than to slip away from what is natural, adding in a few « seductive ingredients ». Theoretically, there exist two forms of regenerating movement : one, common to everyone, consists of natural reactions of our organism such as yawning, sneezing, movements and agitation during sleep, etc. The other was developped by Master Haruchika Noguchi, a half century ago. This is the form we practise (at the Ecole de la Respiration). 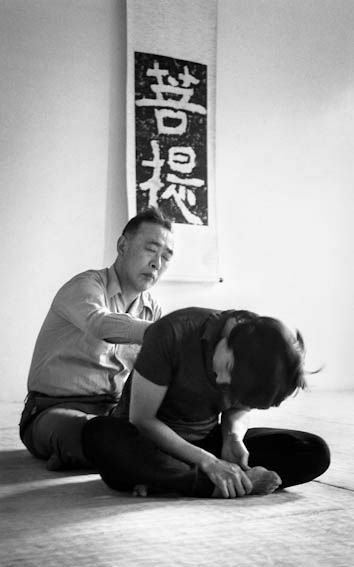 To be initiated to the practice of movement, it is preferable to have reached a certain degree of mental maturity, and that all other proposed solutions be felt to be inadequate. It cannot be imposed on others, not even on your family, and not just any time. It’s essential that the desire for a return to something natural germinates in the inner self. You mustn’t pick fruit before it is ripe. Regenerating movement is not something we acquire from the exterior. It points the way to a deeper discovery of oneself. This way is not a straight road to paradise, but a twisting path. It is up to each of us, and under our own responsibility, to make the discovery our own unity of being. As the body becomes more sensitive, one can experience some perturbing sensations, which can repel those who lack a good initial understanding. The movement, after reaching a marked level of intensity, gradually becomes calmer. It becomes more subtle. Our respiration becomes more profound. Finally the movement comes to coincide with the movement of daily life, becoming so natural that there is no need to do anything special. A natural condition has been reached. This natural condition is not only physical, but psychic as well. A new perspective is created as our aptitude develops for that melding or fusion of sensitivity which affects human relationships and our reactions to life around us. When this fusion widens our spirit, we reach the state of non-body and non-mentallity. We discover then that man is fundamentally FREE.